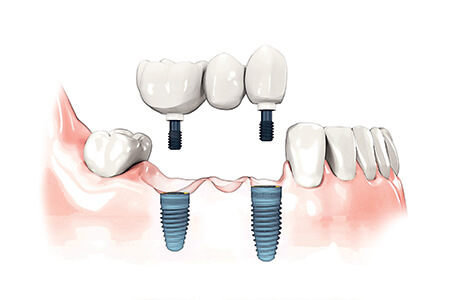 Dental implants preserve bone and provide support to your new natural looking tooth. Unlike dentures, dental implants give you the same biting force as natural teeth, while dentures that are not supported by implants only provide about 10% to 20% biting force of natural teeth. With dental implants, anyone who lost their teeth will regain the confidence in their smiles and will be able to eat anything, knowing that their new implant teeth looks natural and that their facial contours have been preserved. Teeth implants are tiny posts made of titanium placed into your jawbone where teeth are missing. The bone bonds with the titanium post to create a strong foundation for the artificial teeth. Another reason to choose implants is that they help preserve facial structure, which in turn prevents the bone deterioration that naturally occurs when you have missing teeth. Dental implants are modern day miracles that are changing the way people live! With implants, patients are now rediscovering the comfort and confidence to eat, speak, laugh and enjoy life. 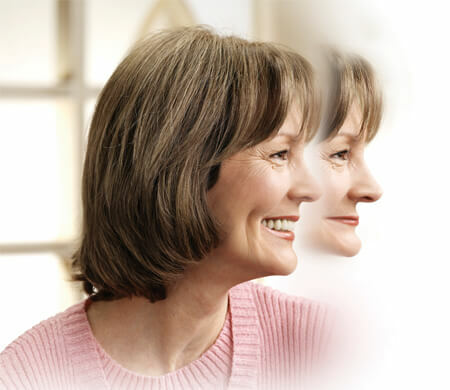 Considering dental implants but not sure if it’s the right choice for you? Come to our Irvine dental office and we’ll help you undergo a dental/radiographic examination and health history. During these consultation visits, your specific needs and considerations will be addressed by a trusted Oral and Maxillofacial Surgeon or Periodontist. Our patients’ questions and concerns are important to us we make it a point to work with our patients very closely for more successful dental procedures. Dental implants are metal anchors acting as substitutes for a tooth root. Surgically placed into the jawbone, small posts are then attached to the implant, which protrudes through the gums. These small posts provide stable anchors for the artificial replacement teeth. It is common for most patients to undergo two oral surgical procedures for the placement of dental implants. For the first surgery, the implants are placed within your jawbone. For the following three to six months after surgery, the implants will be beneath the surface of the gums, gradually bonding with the jawbone. During this time you should be able to wear temporary dentures and eat a soft diet. After the dental implant has bonded to the jawbone, the second phase begins. The oral surgeon will uncover the implants and attach a small healing collar. At this time your dentist will start making your new teeth after an impression is taken. The posts or attachments can be connected to the implants. The replacement teeth are then made and placed over the posts or attachments. The entire implant procedure usually takes six to eight months but most patients report that they do not experience any disruption in their daily life. If you have questions about dental implants or would like to schedule a consultation, please contact our Irvine office.